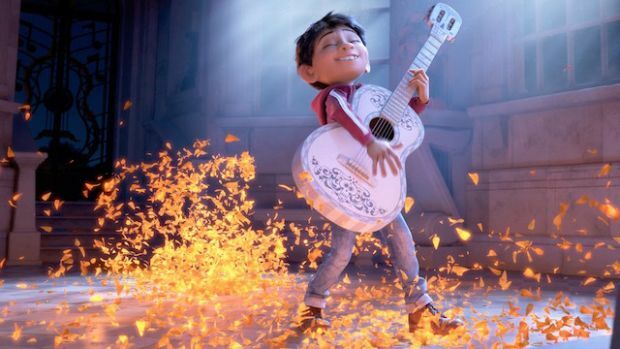 Miguel (voice of newcomer Anthony Gonzalez) dreams of becoming an accomplished musician like his idol Ernesto de la Cruz (voice of Benjamin Bratt)—despite his family’s baffling generations-old ban on music. Desperate to prove his talent, Miguel finds himself in the stunning and colorful Land of the Dead following a mysterious chain of events. Along the way, he meets charming trickster Héctor (voice of Gael García Bernal), and together, they set off on an extraordinary journey to unlock the real story behind Miguel’s family history. The voice cast of Coco includes characters from the Land of the Living and the Land of the Dead. From the Land of the Living, Anthony Gonzalez (Ice Box, TNT’s “The Last Ship”) lends his voice to Miguel, Renée Victor (“Weeds,” The Apostle) provides the authoritative voice of Abuelita, and Jaime Camil (CW’s “Jane the Virgin,” Disney Junior’s “Elena of Avalor,” The Secret Lives of Pets) is the voice of Papá. Lombardo Boyar (Happy Feet, TNT’s “Murder in the First”) voices a town mariachi, and Ana Ofelia Murguía is the voice of Miguel’s cherished great-grandmother Mamá Coco. Sofía Espinosa (Gloria) provides the voice of Miguel’s loving Mamá, and Luis Valdez (Which Way Is Up, director “La Bamba” and The Cisco Kid) lends his voice to Tío Berto, Miguel’s hardworking uncle. From the Land of the Dead, Gael García Bernal (Amazon’s “Mozart in the Jungle”) helps bring to life charming trickster Héctor, Benjamin Bratt (Fox’s “Star,” Doctor Strange) is the voice of Miguel’s idol Ernesto de la Cruz, and Alanna Ubach (Meet the Fockers, Bravo’s “Girlfriends’ Guide to Divorce”) provides the voice of Miguel’s great-great-grandmother Mamá Imelda. Alfonso Arau (¡Three Amigos! director/ producer Like Water for Chocolate, director A Walk in the Clouds) is the voice of Miguel’s late great-grandfather Papá Julio, Herbert Siguenza (Larry Crowne, Ben 10: Alien Swarm) lends his voice to both Tío Oscar and Tío Felipe, Miguel’s late identical twin uncles, and Gabriel Iglesias (Planes, The Nut Job, The Nut Job 2: Nutty by Nature) lends his voice to the Clerk. Natalia Cordova-Buckley (“Marvel’s Agents of S.H.I.E.L.D”) provides the voice of legendary artist Frida Kahlo, Selene Luna (My Bloody Valentine, “Celebrity Wife Swap”) voices Miguel’s aunt Tía Rosita, and Edward James Olmos (Blade Runner, Stand and Deliver) lends his voice to Chicharrón. Directed by Lee Unkrich (Toy Story 3) and co-directed by Adrian Molina (story artist Monsters University) from a script by Molina and Matthew Aldrich (Spinning Man). Darla K. Anderson (Toy Story 3) produces, and John Lasseter is executive producer. 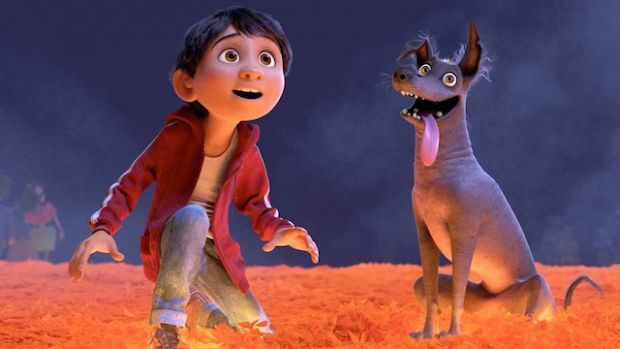 Coco features an original score from Oscar-winning composer Michael Giacchino (Up, Rogue One), a song by Oscar winners Kristen Anderson-Lopez and Robert Lopez (Frozen), and additional songs co-written by Germaine Franco (Dope, Shovel Buddies) and Molina. Also part of the team is musical consultant Camilo Lara of the music project Mexican Institute of Sound, as well as cultural consultants Lalo Alcaraz, Marcela Davison Avilés and Octavio Solis. 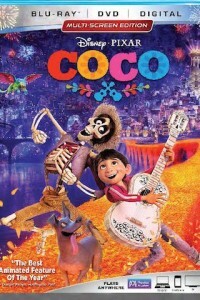 Coco won a 2018 Golden Globe Award for Best Animated Motion Picture, topped the domestic box office Thanksgiving holiday weekend, became the highest grossing film of all time in Mexico, broke records in China and earned widespread praise, receiving 96 percent from critics and 97 percent from audiences on Rotten Tomatoes. .Deleted Scenes With Introductions – Director Lee Unkrich and co-director Adrian Molina talk about the deleted scenes and the part they played in the development of Coco. –Día de los Muertos – In this musical extravaganza, the colors and excitement of Día de los Muertos come to life as we meet superstar Ernesto de la Cruz. –The Way of the Riveras – A musical number in which Abuelita and Miguel prepare their Día de los Muertos celebration while she teaches him Rivera family history and traditions. –Celebrity Tour – Héctor, a Land of the Dead tour bus guide, agrees to help Miguel, revealed to be a living boy, on his quest to find de la Cruz. –The Bus Escape – The Rivera family catches up to Miguel and Héctor and attempts to halt their mission to find de la Cruz. –Alebrije Escape – Miguel and Héctor are interrupted on their journey to find de la Cruz by a fierce alebrije. –The Family Fix – After de la Cruz reveals his true colors, the Rivera family puts their dismay aside and comes together to repair the smashed guitar needed to send Miguel home. –To The Bridge – As the Land of the Dead counts down to the end of Día de los Muertos, Miguel and de la Cruz come head-to-head on the marigold bridge. .Filmmaker Commentary – Presented by Lee Unkrich (director), Adrian Molina (co-director) and Darla K. Anderson (producer). .The Music of Coco- Collaborating with musicians of Mexico and some unique instrumentation, this documentary explores the beautiful fusion of music essential to the story of Coco. .Paths to Pixar: Coco – Explore how the film crew’s personal stories resonate with the themes of the movie itself. 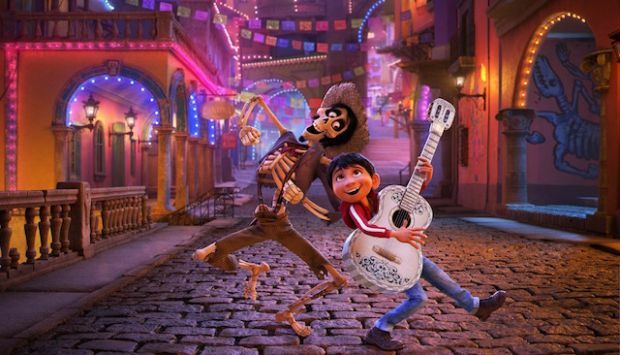 .Welcome to the Fiesta – A musical exploration of the skeletons that make the Land of the Dead in Coco so wondrous and intriguing. .How to Draw a Skeleton – Pixar artist Daniel Arriaga gives a lesson on the quick and easy way to draw skeletons using simple shapes. .A Thousand Pictures a Day – Join the Coco crew on an immersive travelogue through Mexico, visiting families, artisans, cemeteries, and small villages during the Día de los Muertos holiday. .Mi Familia – Developing the Riveras was a labor of love that took the cast and crew on a deep dive into the meaning of family. .Land of Our Ancestors – Watch Pixar artists lovingly construct layer upon layer of architecture from many eras of Mexican history, bringing the Land of the Dead to life. .Fashion Through the Ages – The cast of characters in Coco are from many different eras, making for some magnificent costuming opportunities. .The Real Guitar – The majestic guitar that spurs Miguel on his journey through the Land of the Dead is a unique creation. Watch as it is initially designed by a Pixar artist and ultimately realized as a real instrument by a master luthier in this poetic ode to craftsmanship. 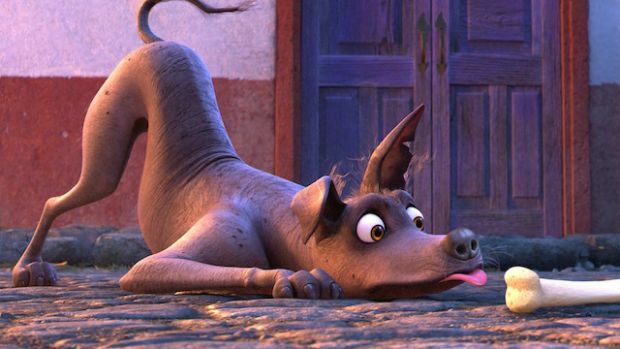 .Dante – How the crew fell in love with the uniquely Mexican breed of Xoloitzcuintli (or “Xolo”) dogs that inspired Dante. .How to Make Pacel Picado – Join Pixar artist Ana Ramírez González as we learn how papel picado is made traditionally, and then try your own approach to this beautiful art form. .Un Poco Coco – A montage of original animated pieces used to promote Coco.